How will the wide-scale adoption of always-on connected devices change the environment for federal leaders? Of the five trends I outlined in my last post, the first, Always-on connected devices, is so fundamental, so important, so paradigm-shifting, that it is quickly becoming invisible. The most recent survey by ComScore found that there are 110 million smartphones in the US – and the Pew Research Center found that 46 percent of US adults own smartphones. Add in feature-phones, which at least are capable of sending and receiving text messages and the number soars to greater than 85 percent. And the pace of adoption, according to Pew, is only accelerating. And of course, government leaders are among those who carry powerful, connected computers in their pockets all the time. Whatever their operating system, whomever the manufacturer, these devices are changing the way that federal executives are collecting and analyzing data to help make their decisions; determining the most efficient use of physical and digital networks; and managing citizen participation in agency activities. Further, the wide-spread (and soon nearly-universal) adoption of always-on connected devices will enhance (at the very least) or enable (at most) the other emerging trends: the expansions of public and private networked sensors; 3D printing plus; advanced sharing; and identity management and the collapsing border between personal, professional, and civic lives. One of the first questions people ask on cell phones is one that would never occur to a land-line user: Where are you? That simple question, asked perhaps millions of times a day, is a data-gathering exercise. On the popular TV show, “24,” Jack Bauer, a US anti-terrorism agent was constantly up- and downloading information from his phone and conveying or receiving intelligence by talking on his phone (it does other things, too, it would seem). And imagine if Tom Hanks' character in Cast Away had found a satellite phone instead of ice skates in one of the packages that washed ashore. All of these point to the ability of connected devices to help us make better decisions—if not to enable us to make certain decisions at all. Free apps give us up-to-the-minute information on flight departures and arrives from most airlines. Storm trackers and emergency planners help us get ready for weather events up to three days away. 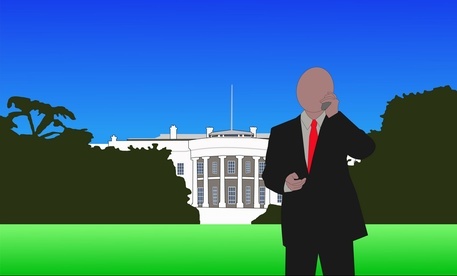 For federal leaders, phones can connect them to email while they’re out of the office, with sensors and real-time reports of all kinds, with quickly-developing situations—whether across town or across the country. Not only do devices connect leaders to other people and to digital assets, increasingly they are capable of performing functions that were once the province of desktop PCs. While this is a good example of phones enabling real-time decision making, it is also an example of using the best communications channel for various kinds of communications. Though a text message might have reached more people (since more people have SMS on their phones than Twitter), there was no service established to warn people of an earthquake via SMS. Conversely, many people had already established accounts on Twitter, so it was able to send messages to many people when the quake hit. Drivers on the road that afternoon could have used Google Maps with a traffic overlay to see how the quake had affected her commute. Or they could have used Waze, an application that uses sensors in the phone (again: I’ll be talking about sensor in greater depth later) to create a real-time picture of transportation networks. Indeed, though driving and using a cell phone is never a good idea, many radio stations across the country have “traffic tips” lines so commuters can share information about their commute in real time. In the near future, with the emergence of advanced sensors capable of interacting with and through connected devices, other physical networks will “come online” as completely as our transportation network, giving federal leaders of all stripes greater ability to manage them. Perhaps the greatest impact will be felt in the area of managing citizen participation in agency activities. And at no time is this aspect of connected devices more important than during an emergency. Citizens interact with their government—especially state and local government, but also federal—all the time and often without realizing it. Weather reporting, as one example, is based on data from NOAA, the National Oceanic and Atmospheric Administration. And of course, during disasters, citizens who want to help or who are receiving that help, can talk to federal workers from FEMA, the National Guard, or any number of state and local agencies. Coordinators from those agencies, as well as citizens and nonprofit organizations, can use both the one-to-one communications of smartphones as well as one-to-many applications (like Twitter or SMS lists) or applications and mobile sites to streamline recovery efforts. In the coming weeks, as I explore the other four trends in this series, always-on connected devices will show themselves to undergird and enable all the other trends. It is easy to forget, in fact, just how fundamental these networked computers have become to our lives, even though they are, relatively speaking, very new additions to our technological toolboxes. Gadi Ben-Yehuda is the Director of Innovation and Social Media for the IBM Center for The Business of Government. Previously, he was a Web Strategist for the District of Columbia's Office of the Chief Technology Officer. He has taught creative, expository, and Web writing for more than 10 years to university students, private-sector professionals, and soldiers. He has an MFA in poetry from American University, has taught writing at Howard University, and has worked in Washington, DC, for nonprofits, lobbying organizations, Fleishman-Hillard Global Communications, and Al Gore's 2000 presidential campaign.